A relatively rare American made lens in good condition. Infinity corrected with a numerical aperture of 0.25. In very good condition this is a Leitz L32 objective with a numerical aperture of 0.40. Standard RMS screw thread. In excellent condition this is a set of hardly used Leica M25 screw thread objectives. Infinity corrected C Plan 0.17 coverslip objectives. x4 (n.a. 0.10), x10 (n.a. 0.25), x20 (n.a. 0.40) and x40 (n.a. 0.65). Extremely good value. Recommended. This is a relatively new Leica 160mm tube length achromatic x100 oil immersion objective with a numerical aperture of 1.25. Standard RMS screw thread. In excellent condition this is an Olympus planachromatic x40 infinity corrected lens with a numerical aperture of 0.65. Coverslip corrected. In excellent condition this is a is a Leitz metallurgical dark field objective with a standard RMS screw thread. NPL infinity corrected, numerical aperture 0.20. These are rare objectives in the used market. PL APO objectives - the class for professionals. They deliver imaging quality that cannot be achieved by conventional objectives. Plan Apochromats provide perfect axial and lateral color matching for applications requiring fast color change and the colocalization of structures. 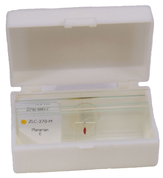 PL APO objectives are characterized by flawless image flatness up to a field number of 25. Top numerical apertures define a resolving power at the limits of what is physically possible. Within the class of apochromats, Leica offers PL APO lenses especially designed to match the highest specifications for confocal scanning (CS). This is one of those objectives  x63 oil immersion offered here at a fraction of the list price. The objective screw thread is the standard Leica M25x0.75 mm (non RMS). This is a collector's item. A black and brass 4mm objective by Beck. Probably dating from the 1930's or so. Condition good. This is a Prior x2.7 achromatic 160mm objective lens finished in brass effect. There are very few of these very useful low power objectives available these days. This is in excellent condition. A x15 objective that fits only the Vision Engineering Mantis Elite. This is unused and represents a massive saving from the list price. In good condition this is a vintage Baker x14 (½") objective finished in chrome. 160mm tube length and a numerical aperture of 0.35. This is an excellent objective. Reichert x100 (oil immersion) with a numerical aperture of 1.30 and in addition it has an iris diaphragm. Tube length 160mm. Condition good. A nice set of 160mm tube length plan objectives from Optotech. 0.17mm coverslip corrected x4, x10, x40 and x100 (oil immersion). Very good condition. This is a set of objectives for a polarising microscope that has the individual clamp mechanism for attaching the objectives (for example our previous model XSP70). Objectives x4, x10, x25, x40 and x63. Each has a mount with its own centring Allen keys (included). 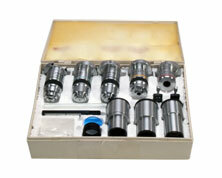 Eyepieces x10, x10 with cross hair and x10 with grid graticule. Stage micrometre, quartz wedge, lambda and ¼ lambda plates. A vintage Beck 16mm objective in very good condition. Brass and black this lens would date from the 1950's when quality optics meant 'quality'. This is a very good example of a Baker oil immersion objective. 1/12th or x100 magnification objective with a numerical aperture of 1.30. In very good condition this is an achromatic x10 objective with a numerical aperture of 0.25. This is a vintage x10 Cooke phase contrast objective which is inscribed with the instruction to use a compensating eyepiece. 160mm tube length, standard RMS screw thread and a numerical aperture of 0.25. In very good condition this is a phase contrast x95 oil immersion objective. 160mm tube length and a numerical aperture of 1.30. Objectives badged Cooke are getting scarce these days. This is an oil immersion with a numerical aperture of 1.30. 160mm tube length and standard RMS screw thread. This is a brushed brass finished x5 objective made in Germany probably in the middle of the last century. RMS screw thread. This is a very interesting objective of French origin. BBT (Barbier Bernard et Turenne) was a French company specialising in lens production and for a time they co-operated with Krauss Industries who have a historical relationship with PZO the Polish microscope manufacturer. It is difficult to date the lens but circa 1960 or so may be about right. Either way it is a good quality x100 oil immersion lens in very good condition. 160mm tube length and standard RMS screw thread. In good condition this is a Wild x100 oil immersion objective with a numerical aperture of 1.30. 160mm tube length and RMS screw thread. Microplan objectives were the best that Vickers produced over the years that they made microscopes. This example is in very good condition. x100 oil immersion with a numerical aperture of 1.25. 160mm tube length with a standard RMS screw thread. A vintage x10 Leitz Wetzlar objective in very good condition for its age. A collectors piece but also a good lens. Dating from the time when the dominant microscope manufactures started merging to survive. Not many bear the joint name of Cooke and Baker. This example is in very good condition. X40 with a numerical aperture of 0.65. 160mm tube length and standard RMS thread. Not strictly an objective but this page is probably its best position. This is a Watson 2mm phase contrast cell complete with its original case. Condition very good. This is a Watson para x40 objective with standard RMS screw thread, 160mm tube length and a numerical aperture of 0.65. Good condition. Not strictly an objective but this page is probably its best position. This is a Baker dark ground condenser attachment, complete with original case. A Watson oil immersion lens from the zenith of the Watson era. As would be expected this is a lens that looks the part, the front element is brushed brass and the remainder finished in black enamel. This is a Hund Wetzlar x4 objective with a numerical aperture of 0.10. 160mm tube length with a standard RMS screw thread. This is a Meopta oil immersion x100 objective in very good condition. Numerical aperture 1.25 with a standard RMS screw thread.